HealthAid Cod Liver Oil EPA & DHA, which are Omega 3 Oils. These are beneficial for maintaining the health of the cardiovascular system and flexible joints. Cod Liver Oil contains Vitamins A & D, which play an important role in nourishing the hair, skin, teeth and gums and also good for eye vision. 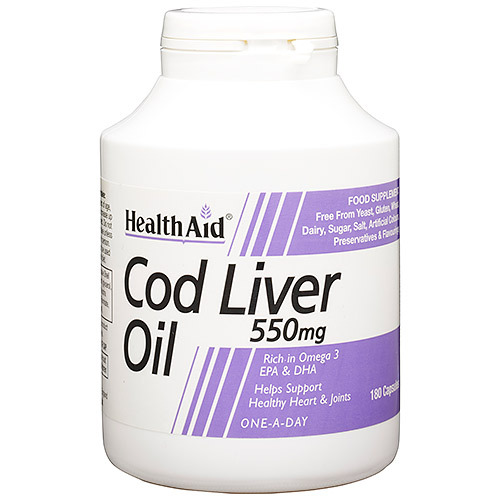 Cod Liver Oil from HealthAid is cold pressed and hermetically sealed in a capsule to maintain freshness and purity. Cod Liver Oil, Capsule Shell [Gelling Agent (Gelatine), Humectant (Glycerol)], Fish Oil, Vitamin E (D-Alpha Tocopherol), Vitamin A Palmitate, Vitamin D (Cholecalciferol). Adults and children over 6 years of age: Take 1 capsule daily. Adults: can increase up to 3 capsules daily if required. 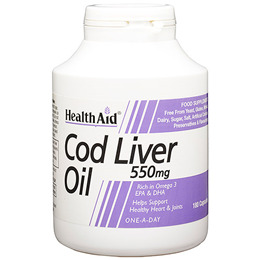 Below are reviews of HealthAid Cod Liver Oil 180 x 550mg Capsules by bodykind customers. If you have tried this product we'd love to hear what you think so please leave a review. HealthAid Cod Liver Oil EPA & DHA, which are Omega 3 Oils. These are beneficial for maintaining the health of the cardiovascular system and flexible joints.